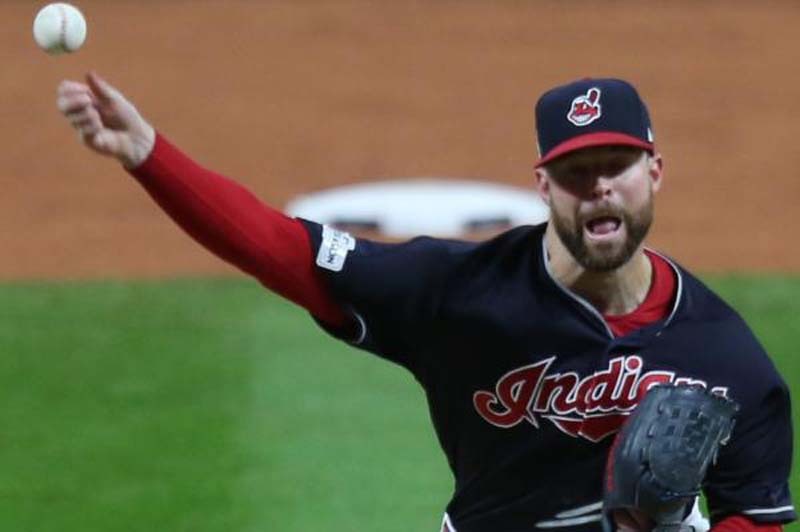 After a historic month of May, two-time Cy Young Award winner Corey Kluber will make his first start in the month of June on Tuesday night as the Cleveland Indians host the Milwaukee Brewers in a brief two-game interleague series. The series will feature the two first-place teams in the Central Division of the American and National League. The Indians had their six-game winning streak halted when they lost three in a row at Minnesota over the weekend. The Brewers got swept by the White Sox in a three-game weekend series in Chicago, but Milwaukee has still been one of the best teams in the majors over the last month. The Brewers have won 21 of their last 31 games. Kluber (8-2, 2.02) was sensational in his six starts in May, going 4-1 with a 1.83 ERA. In 39 1/3 innings, he had 41 strikeouts and only one walk. Kluber also brings two impressive personal streaks into Tuesday's game. He has given up three runs or less in each of his last 24 starts, dating to Aug. 3, 2017. That's the longest such streak by an Indians pitcher in 110 years. Kluber also has 12 consecutive quality starts to begin the 2018 season. That's the most by an Indians pitcher in 100 years, since Stan Coveleski started the 1918 season with 16 consecutive quality starts. Thanks to Monday's off day, Kluber will be facing the Brewers with an extra day's rest. "We rely on him so much, it's nice that he's getting an extra day (between starts)," said Indians manager Terry Francona. Ironically, Kluber's last loss came to the team he will face Tuesday night. On May 8 in Milwaukee, in Kluber's only career appearance against the Brewers, they beat him 3-2. In that game, Kluber pitched six innings, allowing three runs on five hits, with four strikeouts and one walk. In four starts since that loss, Kluber is 3-0, with a 0.68 ERA. In 26 1/3 innings over that stretch, he has 31 strikeouts and no walks. Kluber's mound opponent on Tuesday will be Brewers right-hander Junior Guerra (3-3, 2.65). In his last start, a no decision against St. Louis on May 30, Guerra pitched six scoreless innings on four hits, with seven strikeouts and no walks. In his last three starts Guerra has no decisions but a 1.65 ERA and .217 opponents' batting average. This will be Guerra's second career appearance against the Indians. His first came on May 9 of this year, when he was the losing pitcher in a 6-2 Indians victory. Guerra pitched five innings, giving up four runs on six hits, with nine strikeouts and two walks. One of the challenges for Guerra on Tuesday will be Indians DH Edwin Encarnacion, who was the American League's Player of the Week last week, when he hit .407 with two doubles, five home runs and 13 RBIs. "He can put us up on his shoulders," Francona said. "If he starts heating up like that, it'll be tremendous." The Indians are the only team in the majors with five players with 10 or more home runs, and five with 30 or more RBIs: Jose Ramirez (18 homers, 41 RBIs), Encarnacion (16 and 40), Francisco Lindor (14 and 35), Yonder Alonso (11 and 33) and Michael Brantley (10 and 38).